This amazing book pulled me in from the very first paragraph. The writing style is so inviting, open and honest. It’s like you are in the middle of a conversation with the author. Nothing feels pretentious or forced. You feel what she feels; her excitement, her uncertainties, her fears, and her joys. Katrell starts out as a young woman running a tea shop. One day a young woman comes in and a friendship develops and suddenly talks of a trip to India begins. Other than serving tea from Darjeeling Katrell never gave India a thought. But she is slowly convinced to go and little did she know that her whole world view would change as a result of that trip. She learns while there of the treatment of women – especially those of the lower castes. Even worse is what happens to orphans. These young ladies are tossed at 17 with nowhere to go and no skills to help sustain them She felt compelled to help. Little by little and with many failures as well as successes she creates a way to teach these girls to value themselves and to not only support themselves but to also give back. It’s an amazing story. I think one that everyone should read. 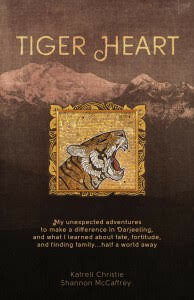 One lucky reader (US/Can) will win a copy of Tiger Heart. Just enter as many ways as you would like on the Gleam Widget below. Full rules are on the widget. Good luck everyone.